After months of discussion and marketing analysis, we are proud and privileged to work on the launch of Aspire Healthcare Partners – a merger of three leading Central Florida organizations: The Center For Drug Free Living, Lakeside Behavioral Healthcare and Seminole Behavioral Healthcare. Together the organizations’ collective experience, expertise and professionalism form Aspire Healthcare Partners, Central Florida’s Source for Behavioral Healthcare Services. 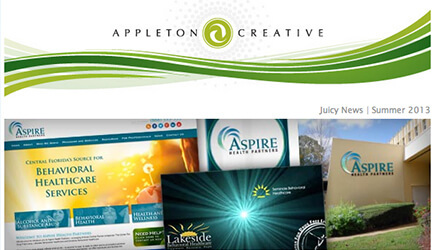 To visually represent Aspire Healthcare Partners’ new identity, Appleton Creative designed their marketing and branding campaign including logo, messaging, print collateral and a website in-progress. Additionally, we designed press materials and an inaugural community video for the public announcement on June 5, 2013.